It usually takes me at least a year to get to somewhere in Birmingham after it’s opened, so I feel that making it to Baked in Brick‘s new permanent home relatively soon after it opened is a bit of an achievement. I’ve tried their food before, as have most people who have been to any kind of street food-focused event in the Midlands, though I can’t really profess to be an expert since at those kind of things I often have a drink in one hand and am shovelling anything I can find to eat down my neck. However, there are experts in this kind of thing, and they’ve seen fit to hand Baked in Brick and Lee Desanges a whole load of awards from the British Street Food Awards up to the European Street Food Awards where his creations were declared the Best Street Food in Europe.. All that from a guy who started with a hand-built pizza oven in his garden. And now he’s got his own restaurant just round the corner from Digbeth Dining Club where we’ve seen Baked in Brick so many times. Hurrah. If you’ve seen Baked In Brick out and about, you’ll know it’s all about the mini. Lee converted a classic mini which can be spotted a mile off, complete with wood oven on the back and a barbecue under the bonnet where you can see all sorts of loveliness being cooked over fire. The theme continues in the restaurant, which is a casual but classy space in the Custard Factory. The mini’s still there, in the form of an artistic representation and the wood oven is, of course, the centre of attention. We visited during the glorious heatwave (where’s that gone by the way?) and took advantage of the terrace to eat al fresco. Unsurprisingly, it was packed on a Thursday night, as was the restaurant inside – all testament to the reputation these guys have built up through years of hard graft. 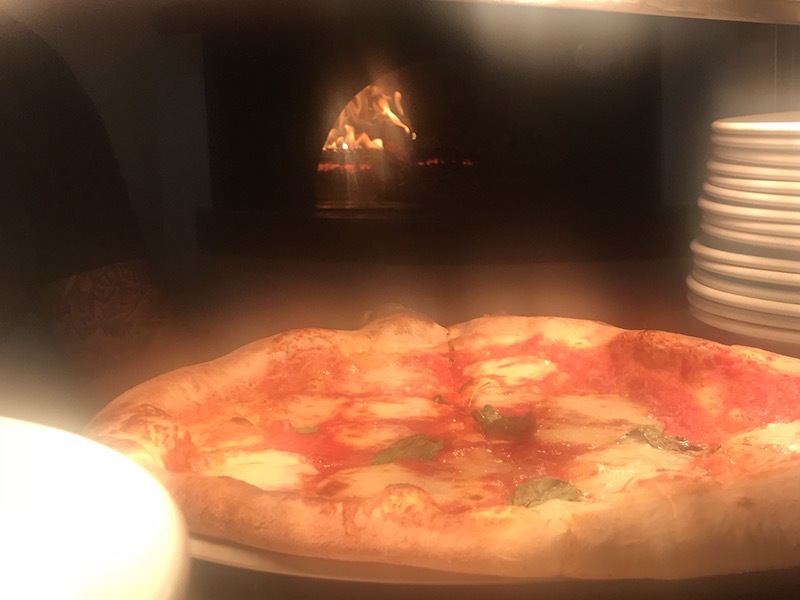 Of course, there’s plenty of pizza on the menu but having a sit-down space has given Lee the opportunity to show off other food that you might not necessarily put on a street food menu (some things just aren’t practical to be eaten on the hoof). 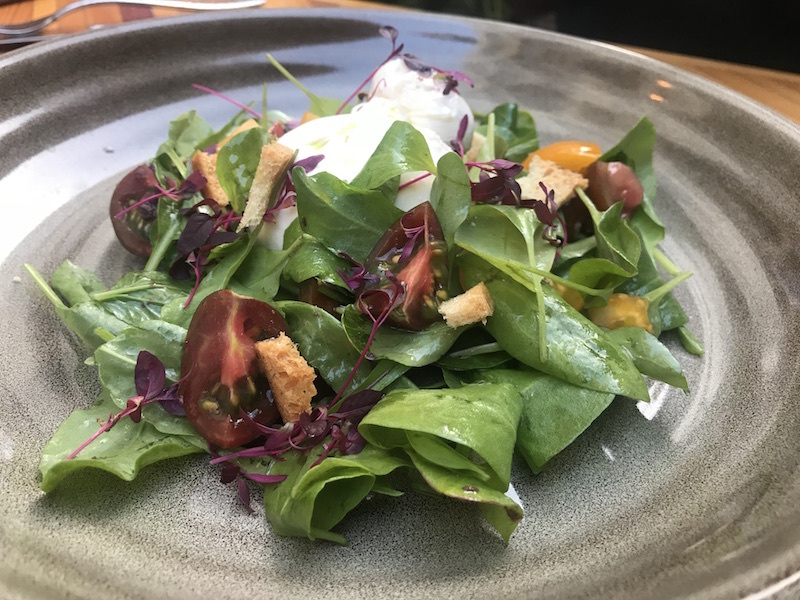 And so, we started by sharing a fresh, restaurant-style burrata salad that proves that good ingredients, served simply, are often the way forward. I’m a glutton for burrata anyway, and the simple combination with leaves, tomatoes and crunchy foccacia croutons reminded me why I gravitate towards it whenever I spy it on a menu. When it all started with pizza, it would be churlish to avoid it. But it’s not just a case of picking out your average flavours. These, too, have Lee’s Baked in Brick stamp on them and remind you how dreamy great pizza can be. 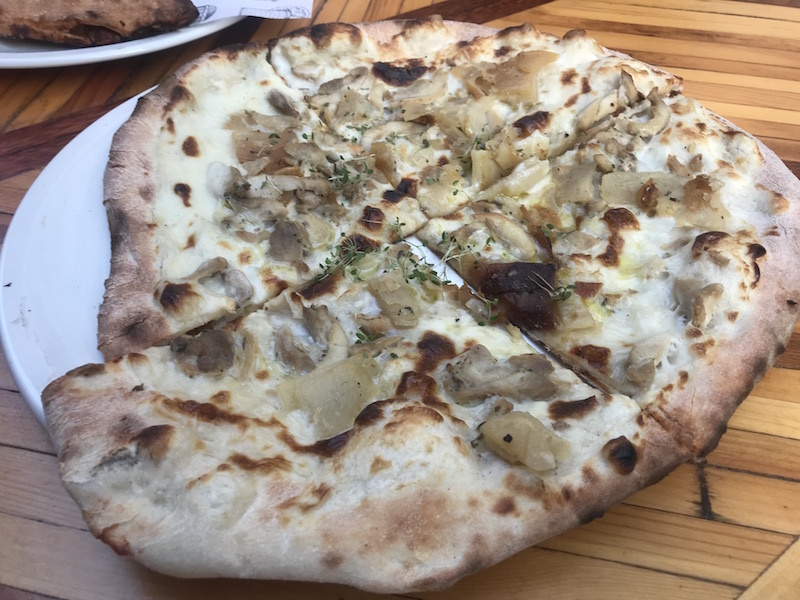 I went for a ‘Blanco pizza’, which replaces the San Marzano tomato sauce with a creamy bechamel, loaded up with smoked chicken and boulangere potatoes on top. It’s no shrinking violet when it comes to flavour, yet also manages not to become a comedy dish that’s overwhelming to the point of laughter. A sign of someone who knows what they’re doing, I reckon. Jamie opted for Lee’s prize-winning classic – a beef shin and wild mushroom calzone that comes with its own Colston Bassett dip on the side. This dish won ‘Best Main Course’ at the European Street Food Awards and it’s easy to see why. The dough is perfectly executed, the same as my white pizza, but it’s the filling that takes this from good to wonderful. A rich, intense mix of slow-cooked beef and wild mushroom that reminds you exactly what ‘depth of flavour’ is supposed to mean. It sits on your tongue, lighting up different tastebuds and staying there long after, willing you to shovel another load into your mouth. 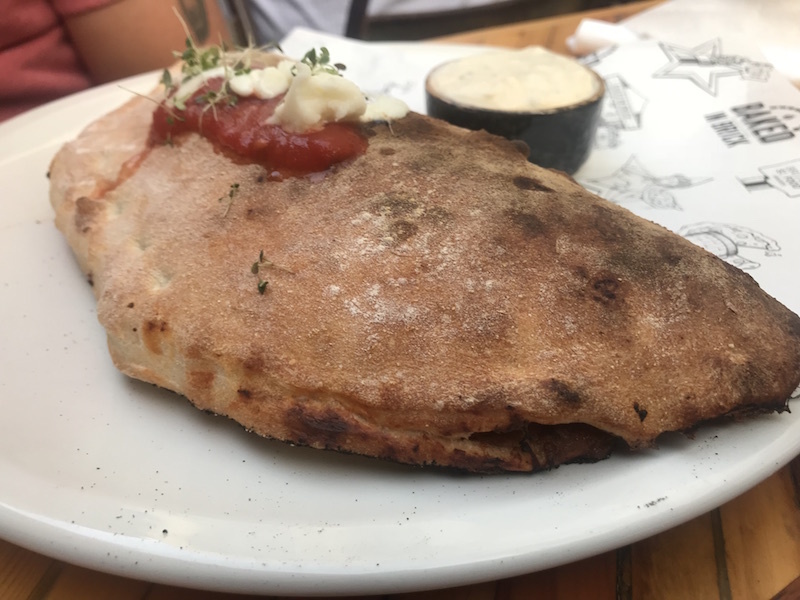 The dip on the side is something I could probably eat along with a spoon and be happy with and combined with the calzone is dreamy. As happy as I am with my own pizza, I’ve got food envy for this and when I return there’s no question what I’ll be ordering. 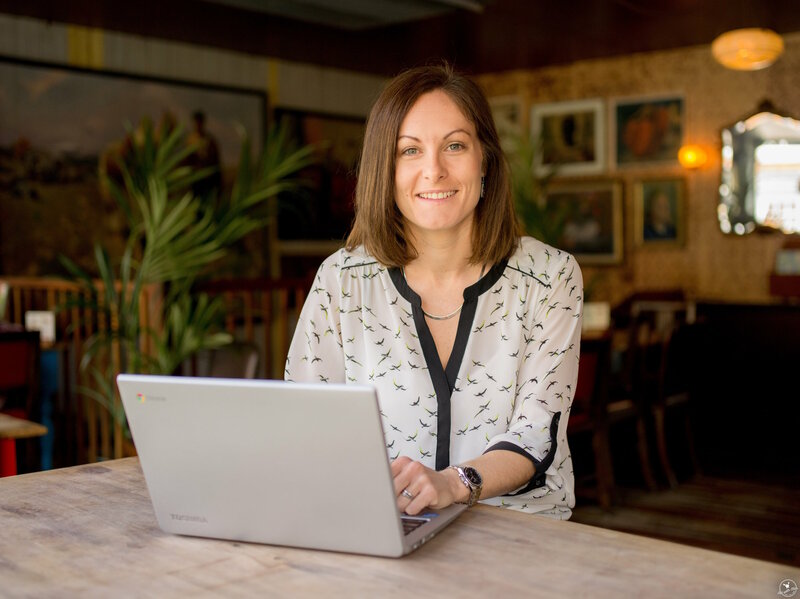 A combination of too much booze (a running theme in my life) and the previous two courses meant we couldn’t manage dessert, but enjoyed our space on the terrace as we finished our drinks and mulled over another epic addition to Birmingham’s food scene. 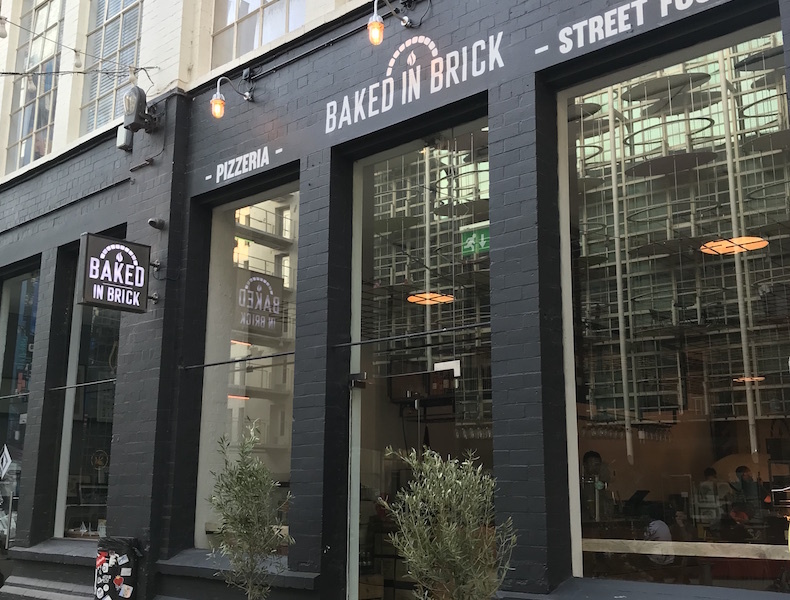 I’d love to say I’ve known all along that Baked in Brick was going to become a firm fixture in Brum. I didn’t, but I can safely say that having met Lee for the first time on this visit I’m not surprised in the slightest. The guy was supposed to be on a day off when we visited, yet could be spotted waiting tables, by the oven and at the pass. You’d have thought after the journey he’s been on he might be kicking back and enjoying the glory, but it seems to me that it’s exactly that kind of attitude that leads to glory in the first place. And glorious it is indeed. Another place to enjoy great food in relaxed surroundings full of people who get that sometimes the simplest can be the best. The pizzas are great but so are the other dishes, there’s a great selection of drinks and Lee’s obviously recruited a team who get what he’s trying to do. I have a feeling this isn’t the last success story we’re going to see from Baked in Brick. We were invited to dine at Baked in Brick and our meals were complimentary.